Perennial, erect, strongly tillering herb, up to 1.2 m tall. Rhizome complex with an ellipsoidal primary corm and bearing numerous straight or slightly curved, cylindrical, lateral rhizomes when mature, which are again repeatedly branched more or less at right angles, the whole forming a dense clump; rhizomes orange yelolow to bright orange, young tips white. Arial shoot with 5 to 10, alternate, distichous leaves, surrounded by bladeless sheaths which compressed to form a short pseudostem; ligule small, membranous, early caducous; petiole 1-10 cm long; blade oblong-lanceolate, up to 70 cm by 18 cm, base cuneate to rounded, apex acute to caudate. Inflorescence terminal, erect, spike-like, appearing from the center of leafy shoot; peduncle terete, up to 20 cm long, covered by pubescent bladeless sheaths or scales. Spike cylindrical, up to 20 cm by 8 cm, bearing numerous, spirally arranged bracts; bracts elliptic-lanceolate, adnate to each other in their lower part, upper parts spreading; lower bracts light green with white longitudinal streaks or white margins, the larger, upper, sterile bracts (or coma) white to pinkish tinged. Flowers in axils of bracts, long and narrow, 5-6 cm long, white to yellow-white, opening one at a time. Fruit subglobose, 3-lobed, rarely seen. 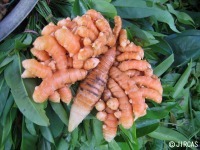 This is a commonly cultivated herbs in backyard garden and in a larger scale for its rhizome. 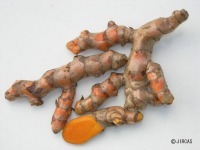 The yellow rhizomes are used to flavor and give color to food. It is used medicinally to treat stomach ulcer and is added to various cosmetics. They are grown from a small piece of rhizome with 3-4 buds. The growing season is during late dry season or early rainy season. It takes at least 6 -10 months before the rhizomes can be harvested.